It’s hard to say when my exact “journey” began with what we now know is Cushing’s Disease. Both my Mom and my doctor believe I’ve had this for years, when I started having period problems, migraines and unexplained weight gain in high school. I can safely say that I started really noticing/documenting this last round of health issues in the spring of 2007. I can remember my first doctor’s visit regarding the onset of this in spring 2006, but the majority of my health issues really began a year later. I’d always suffered from migraines, but only around my menstrual periods. I took birth control to help with that, and it also helped regulate my periods for the majority of my adolescent and young adult life. In Spring 2007, however, I started experiencing cluster migraines that were debilitating, blinding and just absolutely horrible. I don’t usually have a primary care physician because I’m, for the most part, a really healthy girl. But I started seeing a doctor to pinpoint the cause of the migraine headaches. I had a CT scan which came back negative for any problems. I tried different abortive medications to treat the migraines when I had them (Imitrex) and also preventive medications (Topamax) but nothing helped. I’m not a big fan of popping pills and insisted that I find the cause of the migraines, rather than just masking them with an expensive, non-generic daily pill. I cut back on caffeine, avoided certain trigger foods, changed the lighting in my house and in my office, had my eyes checked and even experimented with different birth control options, since estrogen can be a huge trigger for migraines in women. Those lifestyle changes helped a little, but I was still having them. Read more at My Journey | Living with Cushing’s Disease. Rachel will be our guest in an interview on BlogTalk Radio Wednesday, June 3 at 6:00 PM eastern. The Call-In number for questions or comments is (657) 383-0416. 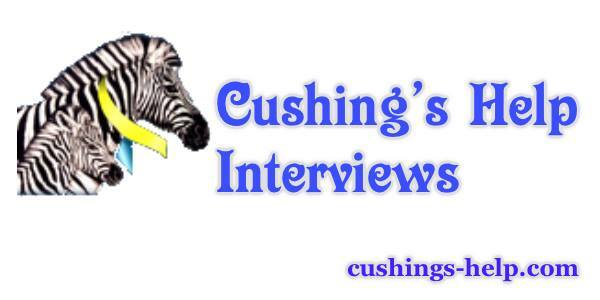 The archived interview will be available after 7:00 PM Eastern through iTunes Podcasts (Cushie Chats) or BlogTalkRadio. While you’re waiting, there are currently 84 other past interviews to listen to!